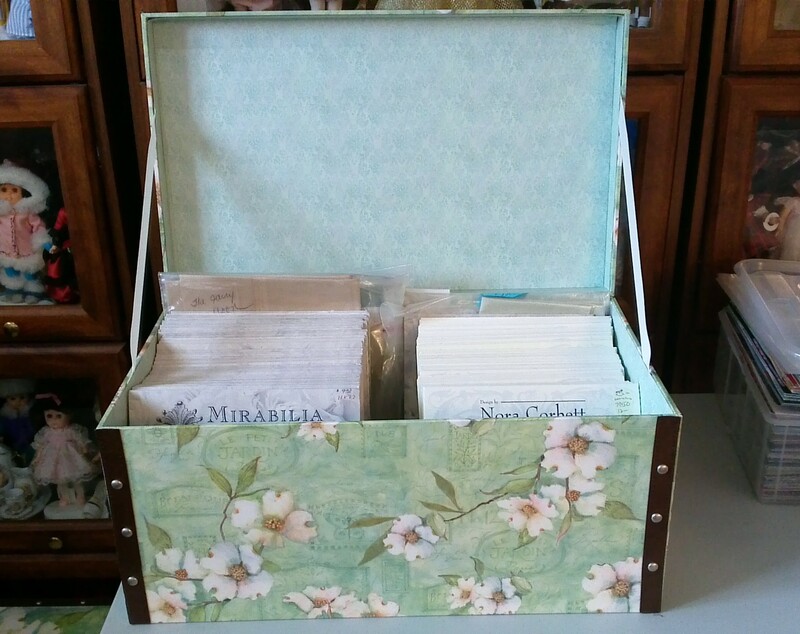 I found a new home for all of my Mirabilis and Nora Corbett patterns. And what is so great is that it matches my trunk that holds my hand dyed fabrics. You can see that post here. I have all of my Mirabilis patterns on the left and all the Nora Corbett patterns on the right. There are a few patterns in the back that are in bags with a fabric that I chose to stitch on. If I take the bagged patterns out (and maybe stitch them some day) I will have a little more room to grow my pattern stash 😉 I love being able to flip through all the patterns and remind myself of what I have yet to stitch. 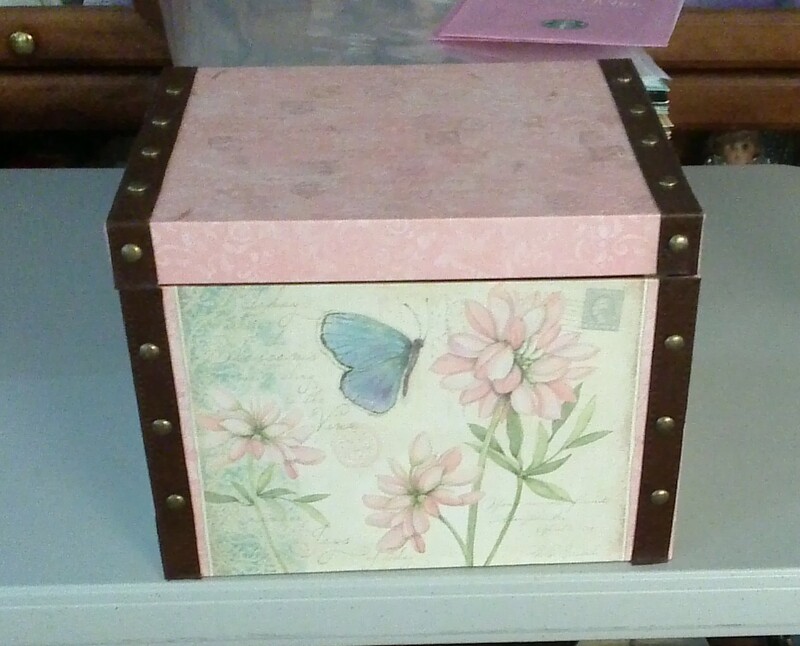 I also have a cute smaller box. In this one I am keeping my bead packs for some of the Mirabilis and Nora Corbett patterns that I have. I love these boxes. I purchased them at Joann Fabrics. They are quite pricy, so 40% and 50% coupons really helped. Seeing these beautiful boxes all stacked up and organized inside makes me happy :). What is your favorite way to organize? Previous Post Section 13 of the SAL is Finished! Next Post What a Tail! Your boxes are gorgeous. 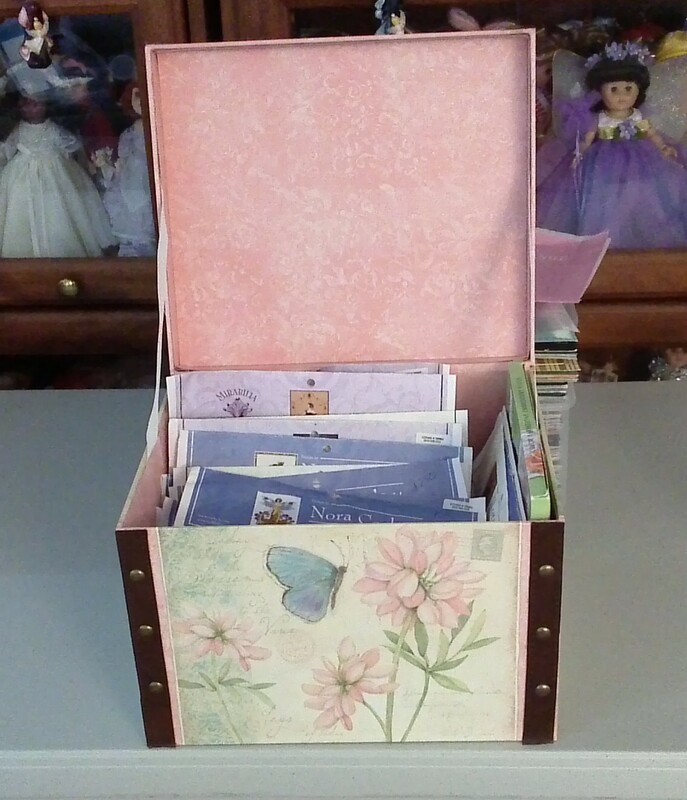 I love to use boxes and antique containers as well. They work so well, and are really pretty. Wonderful way to keep it all organized. That’s the other part that we love to do after stitching! These are so cute. I’ve been looking everywhere for boxes like that but can’t find any. Wish e had a Joann Fabrics in Canada. They are so nice, Dima. Have you tried Joann.com? I have not looked there to see if the boxes are on-line, but it’s a possibility. How lovely! Me, organize? When?? Yes, I desperately need to do that! !Have hair to do b4 work. Then, groceries, if I am still standing. May have to do that Saturday-which is def not the day to shop!! Thank you, Fawn. I have been collecting Mira’s since the early 90’s 🙂 Wish I could say that I have stitched most of them, but I can’t. But I am working on it. Sometimes it is all about the stash, LOL. Such a pretty way to be organized. I wish I had a craft room-I had to give mine up. I would love to flip through those patterns-eye candy for sure! I’m just getting back into cross stitching when I came across the Mirabilia Mermaids and missed out on so much. My cross stitch and knitting and crochet stuff didn’t make it to my craft room. 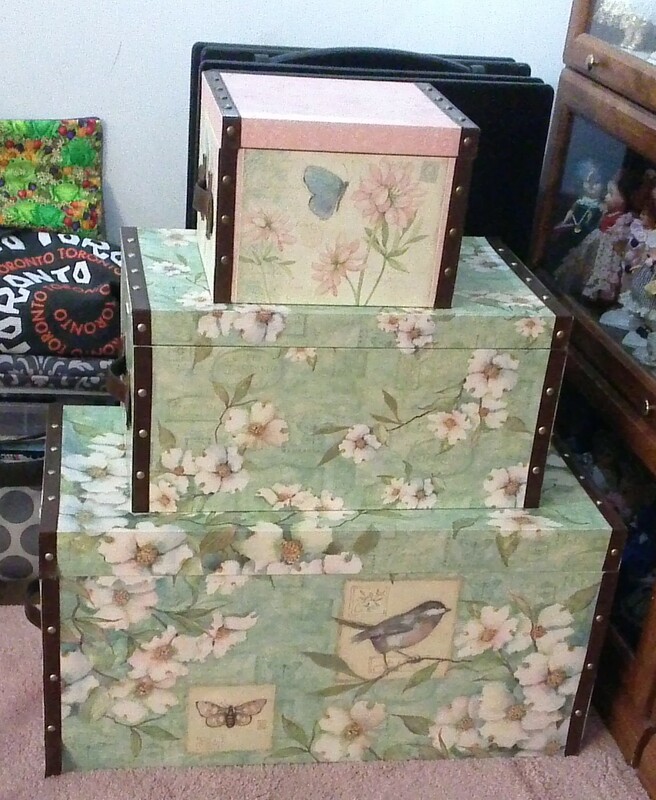 Too much stamping and scrapbook supplies 😉 So my trunks are actually in a corner of my living room. I have been collecting Mirabilia’s almost since her beginning..since Winter Queen came out. I know that some are now out of print, but there are still many of them still in shops. I especially love the Mermaids and the ladies in big, poofy dresses.